If you would like to hold a business lunch/ meeting in Stourbridge, Balti Bazaar is a really different venue in the heart of the lye. We can tailor make a business lunch package for you with provision for up to 70 delegates. With our dedicated staff, wonderful food and professional service, Balti Bazaar makes an excellent place to hold a business Lunch in Stourbridge. Simply let us know your requirements and we’ll take care of everything else. The Room is located on the first floor of the restaurant, which is totally private from the rest of the restaurant. Our room present is a self-contained and flexible meeting and conference facility. The facility is perfectly suited for a theatre-style meeting with a capacity of 50 delegates or a boardroom-style meeting for up to 70. We are happy to mix and match to tailor a suitable business package to meet your specific requirements. 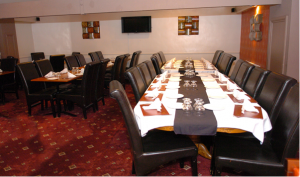 Just contact us to discuss the facilities and food you would like for your meeting.